Andrew Wiggins scored 19 of his career-high 27 points in the first half of Saturday's big win over TCU. Andrew Wiggins scored 19 of his career-high 27 points in the first half and No. 8 Kansas never gave TCU a shot at a repeat of last year’s huge upset, beating the Horned Frogs 91-69 on Saturday night. The Jayhawks (15-4, 6-0 Big 12) won their sixth straight game and remained the only Big 12 team without a league loss. Kansas didn’t get to extend its run of wins in four straight games against ranked opponents, the first team to do that since North Carolina in 1996-97. In their visit to Fort Worth last year, the Jayhawks became the first top-five team to lose to the Horned Frogs in a 62-55 defeat. This time, Kansas had 53 points at halftime and led by as many as 24 in the first half. Brandon Parrish scored 15 points to lead TCU (9-10, 0-7). The Horned Frogs are the only conference team without a league win and are 2-23 in their two Big 12 seasons. Joel Embiid had 14 points, six rebounds and three blocked shots for Kansas before fouling out for the fourth time this season. Wayne Selden Jr. scored 12, and Perry Ellis had eight points and 14 rebounds. TCU’s student section flashed last year’s score in huge block numbers before the opening tip in case the Jayhawks had forgotten, but Wiggins wasn’t around back then. The top-scoring freshman in the Big 12 made his first three shots and had a pair of 3-pointers and an alley-oop dunk from Selden in the first half. 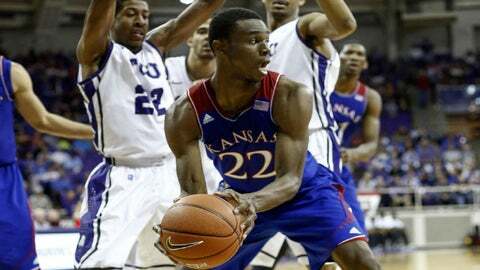 Wiggins topped his previous career best of 25 points against Florida on Dec. 10 and led Kansas with five assists. Wiggins also made it easier for the Jayhawks to exploit their size advantage inside. Jamari Traylor and Embiid had back-to-back dunks to put the Jayhawks up 14-6, surpassing their halftime total of 13 points from last year just 4 1/2 minutes into the game. Kansas, which shot a season-low 30 percent in last year’s loss, was at 62 percent in the first half, which ended with the Jayhawks in front by 21. The Jayhawks shot 57 percent for the game. Conner Frankamp and Wiggins hit consecutive 3-pointers to finish a 13-2 run that put Kansas up 43-22. Embiid, a 7-footer from Cameroon, showed some versatility, beating Amric Fields with a strong spin move for a layup shortly before getting a steal, dribbling the length of the floor and getting fouled driving for a layup. He made both free throws for Kansas’ biggest first-half lead at 51-27. Fields had 13 points and seven rebounds for the Horned Frogs. Kyan Anderson added 12 points and eight assists.